hpgrp GALLERY NEW YORK is pleased to announce “Japanese Samurai Fashion”, an exhibition of mixed media images by Japan based artist and cultural interpreter Everett Kennedy Brown. In conjunction with the March anniversary of the 2011 Great East Japan Earthquake the exhibition will be held from February 28th to March 25th, 2017. 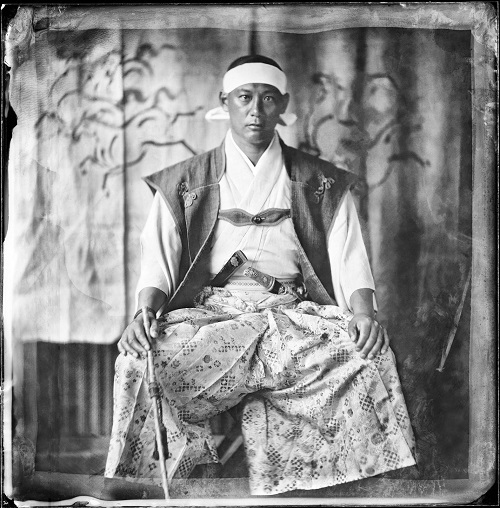 Using wet plate collodion photography and advanced digital techniques Brown presents a multilayered visual experience that offers uniquely fresh and powerful insight into the rich cultural tapestry of samurai fashion, as it continues to exist in the lives of the people living in Soma, Fukushima (the site of the recent nuclear disaster). Through his friendship with Michitane Soma, the 34th generation head of the Soma warrior clan, Brown was given access to photograph the local people of Soma, who have been continuing their samurai horseman heritage for more than 800 years. Though Brown has exhibited and published his work widely in Asia and Europe, this is his first solo exhibition in New York. The “Japanese Samurai Fashion” exhibition presents two major bodies of work. Using antique lenses and wet plate glass negatives, Brown took portraits of 44 Soma residents wearing traditional samurai costume that they wear in the annual “Nomaoi (Wild Horse Chase) festival. In exposures of 10 seconds the men, women and children draped in formal samurai wear that have been handed down from generation to generation, reveal a soul and strength of spirit that transcend time and space. Brown’s exceptional images capture old layers of Japan that ask fresh new questions into the meaning of history and represent important cultural documents that will be sources of study and insight for time to come. In Brown’s second body of work presented in the exhibition, using advanced digital techniques, he juxtaposes two major elements of Japanese aesthetics. His color images articulate the flamboyantly colorful “Kabuki-like” aspects of Japanese culture that stand in contrast to the subdued “wabi sabi” aesthetic revealed in his classic wet plate black and white images. Based on color photographs Brown shot of 108 samurai horsemen, the images vividly focus our attention to the rich tapestry of color and design to be discovered in samurai fashion. The cultural importance of this body of work is evident in that these images ask serious questions for the first time ever about the origins of samurai fashion motifs and their influence from South East Asia, India and Middle Eastern textile traditions. According to respected critic and cultural icon, Seigo Matsuoka, "In the history of Japanese photography, no other foreign photographer has documented Japan with deeper insight." In this exhibition, Everett Kennedy Brown has brilliantly fused tradition and innovation to provide fresh new insight into aspects of Japanese culture that have not been explored until now. Copies of his new book “Japanese Samurai Fashion” will be available for purchase and signing at the reception party on Feb.28th. Everett Kennedy Brown is co-founder of the Kaisho Project, along with Prince Tadahiro Konoe and Ietoshi Kaneko, the 27th generation master of the Takeda Yabusama (equestrian samurai) tradition. Kaisho Project, with its aim to revive Japanese historical traditions lost since the Meiji and post-war periods, is just one of many projects Everett is involved in to promote Japanese cultural revival. He advises numerous government agencies, including the Prime Minister’s office on cultural policy and is the recipient of the Cultural Affairs Agency Commissioner’s Award for promoting Japanese culture. With his wife, bestselling cook book writer, Deco Nakajima he established Brownsfield Farm to teach young people about traditional Japanese ways of living. He writes regularly in Japanese and has co-authored a highly acclaimed book on Japan with leading Japanese thinker, Seigo Matsuoka. His current project is to photograph the young descendants of Japan’s aristocratic families in wet plate collodion. Formally the Tokyo Bureau Chief of European Pressphoto Agency, during his 25 years in Japan, Everett has been fortunate to travel extensively throughout the country and photograph many uniquely remarkable Japanese people. His work has appeared in National Geographic, GEO, The New York Times, The London Times, TIME magazine and other major media worldwide. His wet plate photographic images have been exhibited at museums and galleries worldwide and have been featured at the DAVOS summer and winter conferences.